The Wine Bloggers Conference is a combination of geeking out about wine, socializing, and learning a bit along the way. This session was an incredible study into the Albariño grape and the wines of Rías Baixas, Spain. The seminar presented by Lyn Farmer and was one of the best wine presentations I have attended. Lyn is engaging, comfortable speaking in front of a group, and VERY knowledgeable. Most presenters do not have this trifecta. I can’t count the number of times I have attended a presentation by someone who is clearly not comfortable speaking in front of a crowd! He is also a James Beard Award-winning wine and food writer, broadcaster, and editor. Ok, let’s get down to business! 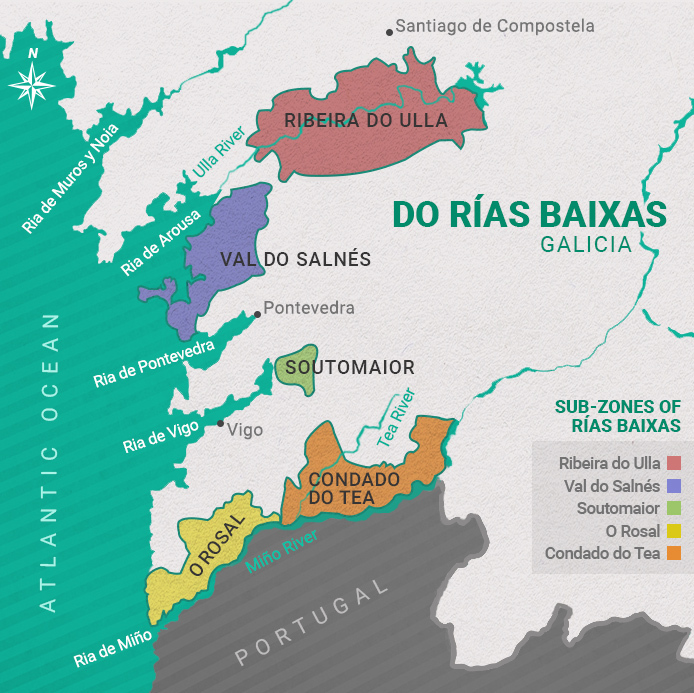 We are discussing the Denomination of Origin (DO) Rías Baixas in the Galicia region of NW Spain, which was formally established in 1988. Rías Baixas has over 9,000 acres under vine and a total of 6,500 growers. Fun fact: over half of the winemakers here are women! Why, you ask? Men, for centuries, have worked in the maritime industry, with many sailors away on ships for months on end, year after year. The women were left to rear children and manage many agricultural tasks, including grape growing and winemaking! As you can see in the map above, there are five estuaries within the Rías Baixas region. These estuaries are deep, wide inlets of water reaching many miles inland from the Atlantic Ocean. These “arms of the sea” mix fresh and salt water to sustain rich maritime life. Local legend says the estuaries are the five fingers of God’s hand when he rested in Galicia after creation. Galicia, also known as “Green Spain” is covered in green fields and mist. Its proximity to the Atlantic Ocean brings a cool, maritime climate with heavy rain and abundant sunshine during growing and ripening season. This makes for good acid and balance in the wines. 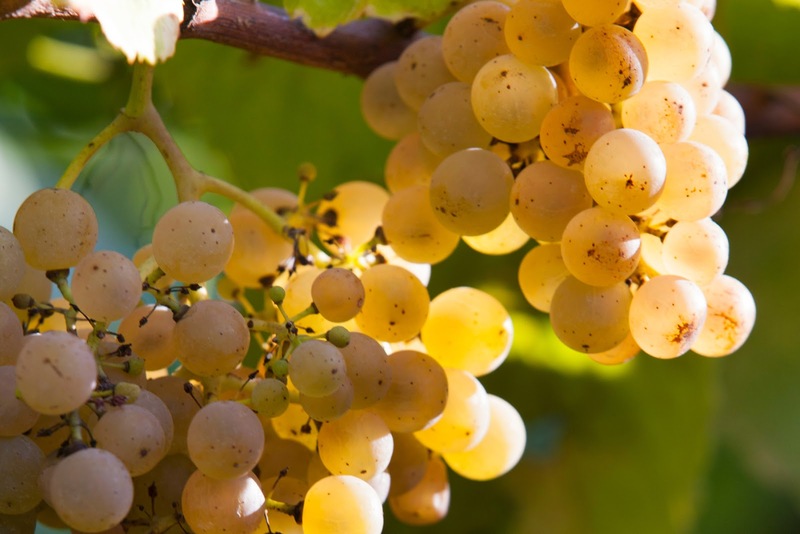 99% of all wine produced in Rías Baixas is white. 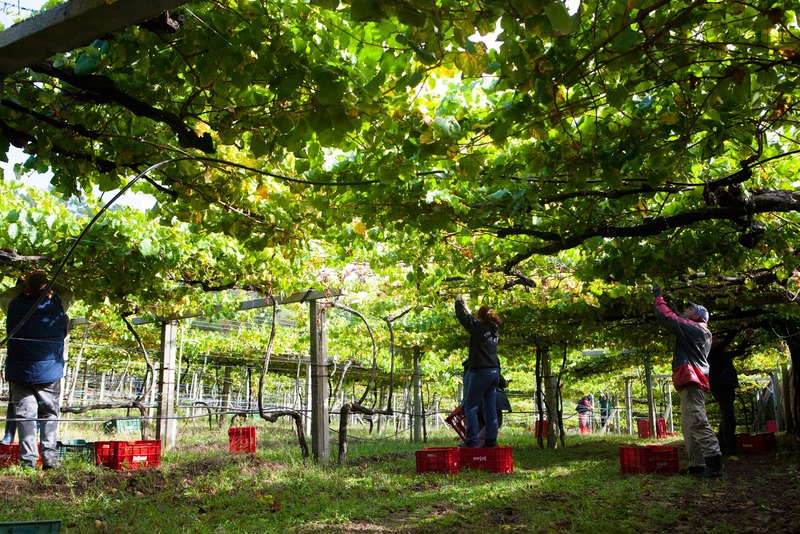 There are 12 grape varieties allowed, but the indigenous Albariño makes up 90% of plantings and is the flagship of the region. The grape gives classic aromas of citrus, green fruit (pear), stone fruit (peach, apricot), tropical fruit (ripe melon, mango) and honeysuckle. Albariño is a very food-friendly grape because of the good acidity and minerality. To say it pairs great with the local seafood is an understatement! As a general rule, Albariño should be enjoyed upon release, though some have enough structure and complexity that allow for aging. 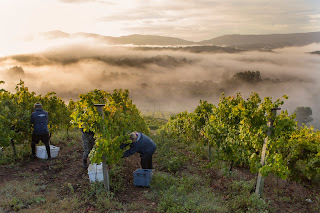 The soils of Rías Baixas are uniform, hard granite soils with mineral-rich alluvial top soils. Alluvial soils are soils (clay, silt, sand, and gravel) that form over time from deposits left by running water. To counter the rainfall and humidity (which can bring both mold and rot) most vines are trained on wire trellis’ or “parra” anchored by granite posts. This method elevates the vines higher than most other training methods to allow maximum circulation to prevent mildew and to promote even ripening. The harvesters even need to stand on grape bins to reach the bunches! It is worth noting that some vineyards are moving to double cordon to modernize. In the winery, modern, temperature controlled winemaking in stainless steel tanks is the norm. Grapes are delivered from the vineyard to the production facilities quickly to avoid oxidation. Many wineries ferment with wild yeasts and are experimenting with extended lees aging to develop character and complexity. This wine has a melon character with high acid and salinity. A local, indigenous yeast is used for fermentation. A cold fermentation is used to preserve the fresh fruit aromas. This wine is made in the Val do Salnés region, which is the original and oldest sub-zone in Rías Baixas. The vines for this wine are all pergola trained. The grapes undergo a cold soak for 8 hours. This wine offers me green fruit (apple) and stone fruit (white peach). With 30,000 cases of this wine produced, this winery is one of the largest in the region. This wine is a smidge less fruity and richer than the first two wines. I get green apple, white flower, and earthiness (which is not common for Albariño!). This was one of the first wineries in Rías Baixas. This wine has slight residual sugar (3g/L) and is a tad more elegant than the first three. Notes of grapefruit, pear, honeysuckle, and a lighter tropical fruit note. This wine undergoes some (though not full) malo. I get red fruit (wild strawberries) and stone fruit (peach). This wine is a bit more grown up than the previous ones. Thumbs up for this guy! Very floral, specifically whiteflower. Caiño Blanco almost disappeared from Rías Baixas in the 1980s until Terras Gauda launched an ambitious replanting program in 1989. An interesting showing for Albariño. I would love to revisit this wine, as I didn’t have enough time with it in this “group” situation. I get a savory/umami feel...almost an animal note. Bright, crisp, refreshing, with gripping acidity. This wine was fermented in French oak, hence the vanilla note. Aside from the Pazo de Señorans, this was the most interesting of the bunch.